Trash artist Martin Waters recently sent us a link to his website, a resource chock-full of compelling sculpture, photography and images of past installations. 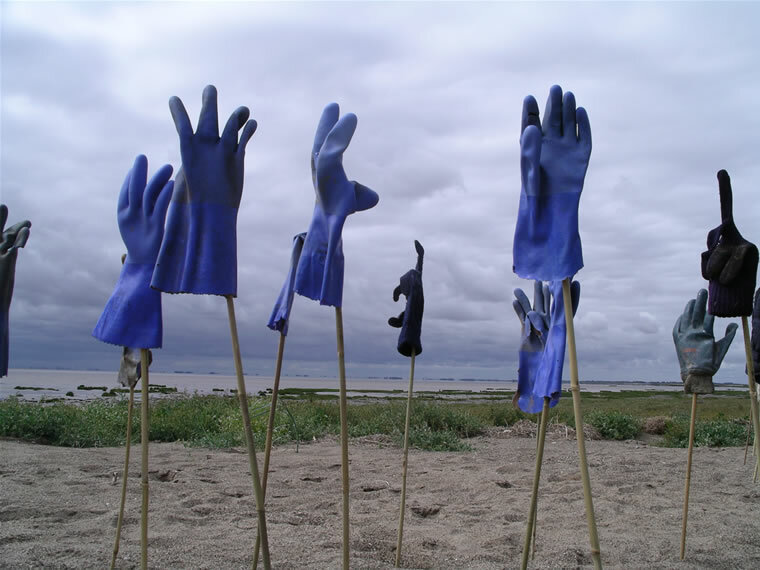 He uses a lot of beach debris in his work, collected from Spurn Point, where he was artist in residence in 2007. Spurn Point is a fast disappearing stretch of the East Yorkshire coastline. It has been the greatest influence on my artistic endeavours for the last twenty years and my life since I was seven years old, living at Paull on the Humber bank. A fascination with painting and drawing naturally led me to this raw spit of land where I started to record my impressions. A love of collecting and beachcombing conspired to bring me to the artworks I create now. Through my art therapy work I am interested in the process of creating art and I have let that process take me where it will. This entry was posted on Thursday, November 5, 2009 at 10:14 am and is filed under Artistic Trash. You can follow any responses to this entry through the RSS 2.0 feed. You can leave a response, or trackback from your own site. Hi Martin from 8D at Huntcliff School, North Lincs. We love your work and keep beachcombing.